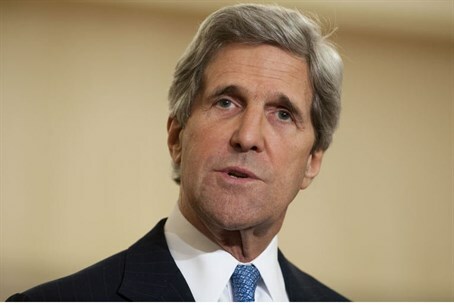 US Secretary of State John Kerry leaves Friday on a 12-day trip during which he will return to the Middle East. US Secretary of State John Kerry leaves Friday on a 12-day trip during which he will return to the Middle East, hold high-level talks in Southeast Asia and make his first visit to India. At the start of his seven-nation tour, Kerry will head first for Doha to meet with top Qatari leaders and take part in a meeting of the core ministers from the Friends of Syria group, State Department spokeswoman Jen Psaki said in a statement Wednesday, according to the AFP news agency. The top US diplomat will then travel to India from June 23-25 for his first official visit since taking up his post on February 1 to chair the fourth annual US-India strategic dialogue. The forum is a way of "reflecting the strong strategic partnership between our countries," Psaki said, adding they will discuss issues ranging from security and defense to science, climate change and economic ties, as well as space cooperation. From Delhi, Kerry will travel to Saudi Arabia to meet top Saudi officials, before heading to Kuwait City on June 26, AFP reported. From June 27 to 29, the US secretary of state will return to the Middle East region with a stop in Jordan before making his fifth visit to Israel to meet Israeli and Palestinian Authority leaders. Kerry is trying to coax the two sides to resume negotiations frozen for almost three years, and has been pursuing what he calls "a quiet strategy" to kickstart the peace process. He had been forced to postpone the trip to Israel planned for earlier this month as the US administration weighed the crisis in Syria. But in his first few months in office, he will now have visited Israel more times than his predecessor Hillary Clinton during her whole four-year tenure. From Jerusalem, Kerry will head to Brunei from June 30 to July 2 for meetings with Asian leaders including annual ASEAN-US talks as well as the ASEAN regional forum and a foreign ministers meeting of the East Asia Summit. He is due to return to Washington on July 2, according to AFP.